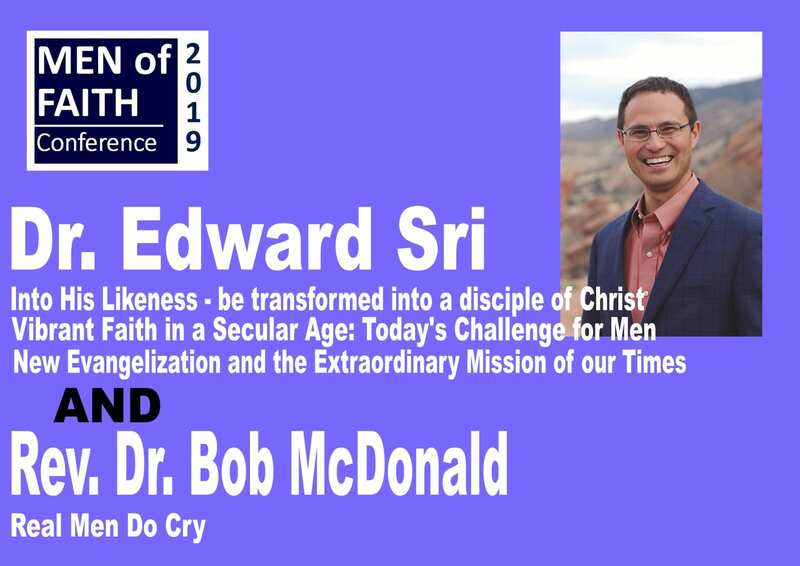 The 2019 Men of Faith Conference took place on Saturday January 19th and featured guest speaker Dr. Edward Sri who spoke on a number of topics related to “Faith in the World Today.” The presence of so many men seeking fellowship, learning, and inspiration to live a life of faith was powerful. View pictures of the event below and listen to audio recordings of the day’s speakers. Join us next year! Seeing this event continue to grow year after year, it's easy to see that men are hungry for a lot more than our culture is offering them. A beautiful opportunity for men to be encouraged and revitalized in their vocation - whether single or married. Dr. Edward Sri is a theologian, author and well-known Catholic speaker who appears regularly on EWTN. Each year he speaks to tens of thousands of people from around the world, including clergy, parish leaders, catechists and laity. Edward Sri is also the host of the acclaimed film series Symbolon: The Catholic Faith Explained. Rev. Dr. Bob McDonald is a retired Medical Doctor now engaged in the practice of Psychotherapy, counseling and spiritual direction in Barry’s Bay, Ontario, Canada. Rev. Dr. McDonald held a teaching position as Assistant Professor of Family Medicine at Queen’s University and was given a Fellowship from the College of Family Physicians of Canada. In 1992 he was ordained a Permanent Deacon for the Diocese of Pembroke, ON. Deacon Bob was a regular guest on the television program Food For Life. Deacon Bob travels widely giving talks, retreats and preaching Parish Missions. Deacon Bob is the author of 2 books: The Catholic Family: Image and Likeness of God. Volume 1 on Family Life and also The Catholic Family: Image and Likeness of God, Volume 2 on Family Values. His two CD Lighthouse Presentations are Anger & Forgiveness and The Eucharist our Very Life. $30/person, $25/student. $45/person at the door. SPACE WILL BE LIMITED SO REGISTER EARLY!